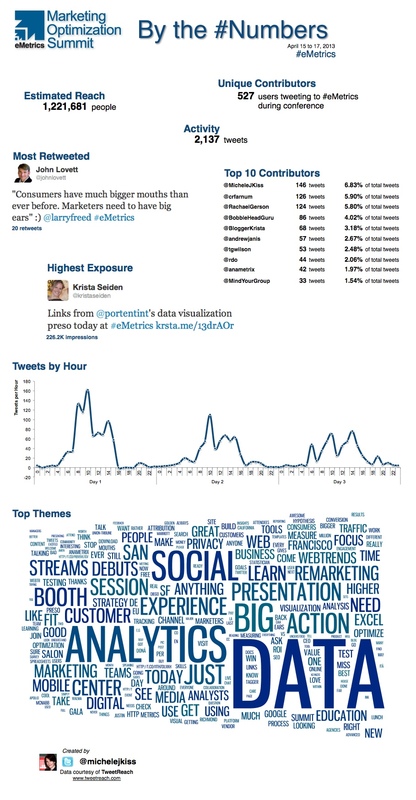 This month the Analytics Demystified team travelled to San Francisco for the eMetrics Marketing & Optimisation Summit. Here are a few of the things that emerged for me from the event. When hiring: Communication is a truly critical skill for analysts. Balaji Bram from Walmart recommends looking for digital analytics talent that can recommend and influence others. One anecdote I loved was Nancy Koons‘, who shared Vail’s internal “tweet your face off” competition. Apart from a friendly competition to see who could refer the most traffic and reservations, a big benefit was that their marketers got really good at campaign tracking! After all, if you are incentivised based on a metric, there’s suddenly much more interest in measuring it properly! In setting expectations, Tim Wilson recommends that rather than asking a client or stakeholder what their KPIs are, analysts need to ask the “magic questions” that lead to the KPIs. “What are we trying to do?” and “How will we know if we’ve done it?” When people are requesting data, don’t ask about dimensions and metrics, and don’t let them put requests in those terms. Ask them to put it in the following form: “I believe that … and if I’m right, I will …” This ensures they have 1) a hypothesis and 2) a plan for action based on the results. It’s impossible to truly wrap up three days of great presentations in a short blog post, but these were certainly a few of the highlights for me.